After the success of the Little Stoke setting and having acquired an excellent team of staff, Joanne and Ruth began a new venture running a term-time provision from a Sure Start Centre in Filton in September 2013. Recognising the opportunity to provide for many families in the local area who are lacking support and childcare services, our Filton setting has become an established, reputable nursery of the local area. With our recent first Ofsted report resulting in a rating of ‘Good’, we are eager to continue developing on our journey as a quality nursery provision. Play Station Nursery @ Filton is a 30 space nursery providing for children aged 2 to 5 years old. The setting is open term-time only, for 15 hours a week. 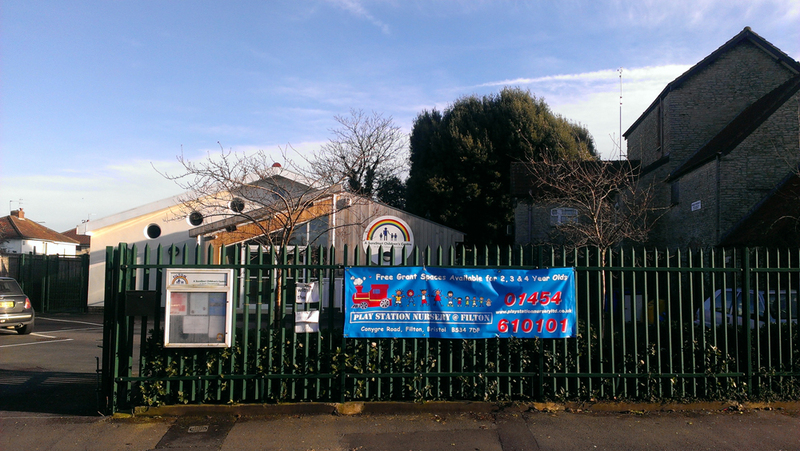 The provision runs from a Sure Start centre in Filton. Local businesses that benefit from our close proximity to the A38 feature Airbus, Rolls Royce and the MOD amongst more. The nursery runs from one large room in the building, benefitting from a wealth of resources that are tailored to the children’s needs. The outside space is a wonderful place for children to explore, featuring construction, sandpit, bikes and trikes, a den, running water, places to hide, and lots of little things to discover and explore. The 2-3’s and 3-5’s run from the same room but have ample opportunity to divide and spend some time playing as specific age groups. Children have free-flow in and out of the buildings into the garden as much as practically possible, we love that we are able to give the children chance to roam and explore their outside environment when they please (with the helping hand of supportive adults). At Play Station Nursery we openly welcome all children and their families. Children accessing the Nursery Education Entitlement Grant are welcomed to the nursery, and if using the full 15 funded hours will pay no fees whatsoever. We also pride ourselves on our history of providing support to children with a range of different needs. Our experienced practitioners can effectively cater for children with dietary requirements, allergies, certain medical conditions, additional needs and special educational needs. There are no extra charges for food, as packed lunches are provided by parents. Snack times are funded by the nursery. Staff see mealtimes as the greatest opportunity to model good eating practices and importantly encourage conversation and discussion. Staff will sit with the children and often eat the same food. Children are encouraged to serve themselves with adult support and feed themselves. Children can join the provision at any time if a space is available. A registration fee of £50 is payable upon children’s registration to Play Station. This fee will contribute to exciting educational trips for the children to enjoy, the purchase of sun cream, protective sun hats and safety bibs, wet weather clothing and the additional supervision required for trips. Children joining Play Station accessing only grant funded hours will not be required to pay a registration fee. A sibling discount to any fees payable will be given when two or more children from the same family attend Play Station. In this event the older sibling will receive a 10% discount from the hourly rate.